authenticating the identity of the customer can be fairly difficult. customers to take additional steps, disturbing the seamlessness of the purchasing experience. Often, this leads to shopping cart abandonment. 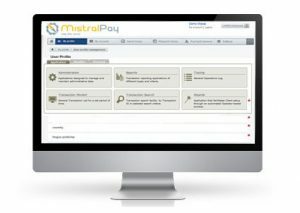 MistralPay analyses and data-mines transactions from the entire network through a series of automated and manual review processes. The review processes incorporate IP reputation and proxy detection analysis, but on a network level rather than at the individual merchant level. MistralPay also investigates associated transactions of flagged orders to uncover additional suspicious activity. For example, if a domain was flagged as having a bad reputation, MistralPay will review all the IP addresses or other attributes associated with orders placed from the flagged domain. This allows MistralPay to uncover additional suspicious activity and derive additional predictive risk factors for future transactions.